In this article, we are going to take a look at 3 examples where Avid Nexis has made a difference to the Pro Tools workflow in 2 post houses and 1 educational establishment. Then we are going to look at what is required to set up a Nexis system working with Pro Tools as well as some pricing guidelines. With the introduction of Avid Nexis software v7.6 and Pro Tools 12.8, Pro Tools is now qualified for use on the Avid Nexis network storage systems, enabling audio creative teams to run Pro Tools sessions off an Avid Nexis storage system sharing projects on a centralised pool of media storage, turning work around faster by eliminating the time wasted moving files between different systems. Avid Nexis and Avid Nexis Pro also provide real-time creative team collaboration using not only Avid Media Composer but other editorial and creative tools including Adobe Premiere Pro CC, Apple Final Cut Pro X, DaVinci Resolve and now Pro Tools, as well as allowing for integration with third-party asset management systems. 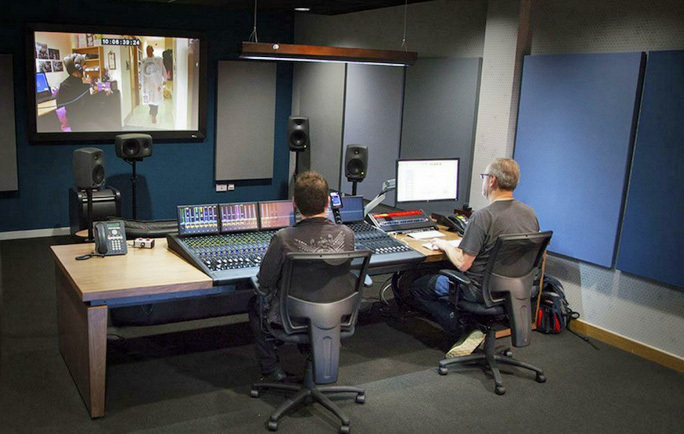 As with many post-production facilities, Avid Pro Tools plays a vital role in Gorilla’s audio post-production capability. The facility relies on Avid’s world-leading audio editing tool for all its editorial and finishing work, including mixing, editing, and recording across its diverse project roster. Gorilla based in the UK is a self-proclaimed “Avid-centric” facility from the get-go back in 1999 and has had a long history specialising in broadcast and film post-production since then. Non unsurprisingly the facility relies on Avid’s audio editing tool - Pro Tools - for all its editorial and finishing work, including mixing, editing, and recording across its diverse project roster. Without a reliable and highly-connected storage system, we can’t turnover work quickly enough to meet client demands. Since merging our Pro Tools systems with NEXIS storage, our picture and audio editorial teams are working in ultimate real-time. The compatibility with Pro Tools benefits everyone, and production processes are much more unified, simplified, and a lot quicker. Over the past 24 years, Monkeyland Audio in Glendale, California, has earned a reputation as a multi award-winning leader in audio post, known for the high quality of its mixes and post-sound services. It’s also managed to maintain its slightly irreverent (its stages are, after all, named after tequilas), friendly yet entirely cutting-edge environment. From the beginning, founder Trip Brock, a prominent supervising sound editor and re-recording mixer, looked to combine boutique services with state-of-the-art technology for premium audio services. Today, a dedicated in-house creative team creates custom sound packages for recording, film and television productions of all sizes and across all genres. They too have been using Pro Tools from the start but with no intention of getting into the mixing side of the post-production workflow until they were persuaded by their clients to offer the full package, mixing, editing, media recording, as opposed to farming out all the different bits. Before the upgrade, significant time was lost shuttling large sets of files around to local drives throughout the facility, either via shuttle drives or copying over a clunkier network. Far too much valuable time was spent administrating data storage on our servers, as well as on editorial and stage systems. We were constantly clearing out the old to make room for the new. That is a pretty amazing claim from a large post-production house. We were using Avid with external drives attached to individual workstations, which meant that students were tied to individual machines, and security and backup were both potential issues. Moving to NEXIS has been transformational, in that it fixes those problems, but also in terms of efficiency. 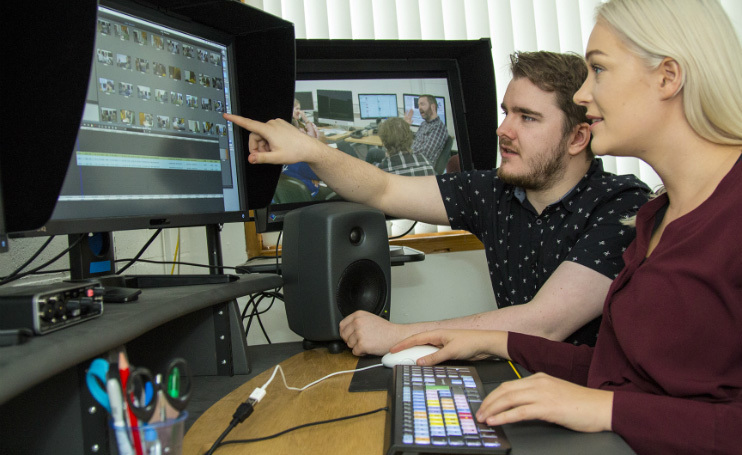 At the moment we have over 100 students taking production modules across film, journalism and digital media courses, and next year we’re expanding into masters-level teaching. Students now have the flexibility to access any seat, instead of having access to one workstation which they may have to share with another group. This means that students can work when they need to, rather than being held up because of technology. Nothing holds them back from being able to do all the post-production that’s required, whereas before they’d be limited as to how much they could do in the available time. It allows creativity to happen rather than forcing it to happen between X hour and Y hour because of the requirements of the space. The performance will vary depending on how your systems are set up so please review the guidelines below to ensure your system is setup correctly for your workflows in your facility. Multi-Threading Improvements - When using Nexis or any other network attached storage with Pro Tools there is now a new preference setting in a section headed 'Misc' entitled 'Parallel Task Optimizations' in the Processing tab that has been added to Pro Tools HD to optimise for different storage mediums. This optimises how Pro Tools handles non-real-time tasks like audio import and rendering workflows. You should also adjust where the Waveform Overview Cache files are stored as local storage of Session Waveform Overview Cache files provides a substantial speed improvement in how long it takes to open the session. You will find this in the Operations tab of the Pro Tools Preferences in the User Media and Settings Location section. 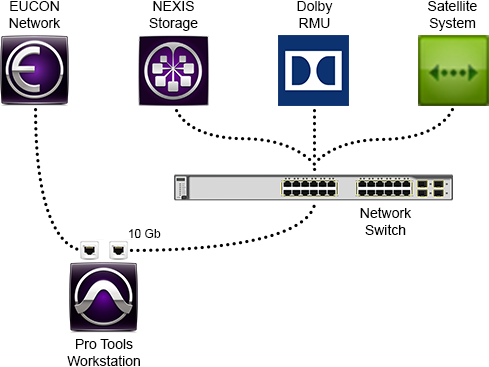 Pro Tools and Nexis need a minimum of a single 1GB connection between the Nexis unit and the computer running Pro Tools. You can better performance if you have either a dual 1GB connections or a single 10GB connection. The faster your connection is, the higher the track count you will be able to stream from the Nexis, and the quicker your Pro Tools disk cache will fill when you open your sessions. In this table below is the number of tracks that can be streamed from a Nexis to one or more Pro Tools HD Systems. Note that this is total audio files playing back simultaneously at a reasonable edit density, although Avid doesn’t specify what reasonable is in this context. However, since most Pro Tools session does not stream continuous audio on every track for the entire duration of the session, your track count is likely to be much higher than your simultaneous audio file playback. * Results may vary depending on Sample Rate, Bit Depth, CPU speed, Mixing and Matching Connection Types and available network bandwidth. **Maximum supported track counts are qualified with 2 mediapacks: E4, E5, 2xE2 (2xPro).,A single mediapack may support up to 4 clients with these track counts, or more clients with lesser track counts. If you need higher track count requirements than what is supported in the tables above or need guaranteed more simultaneous Pro Tools HD users alongside other clients using Nexis you can use the disk cache mode. Disk cache enables users to load all of the audio data from the session into the RAM which can enable extremely high track counts to be played back. After the initial audio is loaded, there is little to no bandwidth used on your Nexis network during playback of audio. All systems that intend to use disk cache with will need to have enough RAM installed to load the entire session and the setting in the playback engine set to accommodate your session. Here is a table that outlines the load speeds various connections with Pro Tools HD and Nexis. With Pro Tools 12.8 Disk Cache load times have been sped up when accessing NEXIS storage. Below is a table showing load times for medium size session on various connection types. Check out the Pro Tools HD 12 System Requirements page for system-specific PCIe Slot Order & Client Configuration guidelines. Proper BIOS configuration is required for best performance on Windows systems. For Windows systems qualified with Pro Tools HD, refer to Pro Tools HD 12 System Requirements page for system-specific BIOS configuration guidelines. Pro Tools HD is qualified as a zone 2 or 3 Avid NEXIS client only. Switched Client — Connected to Avid NEXIS via a 1 Gb port on an Avid-qualified layer-3 switch. Routed Client — Routed client that resides on an Avid-qualified layer-3 switch within the Avid Production Network. Only one hop (route) is supported. Avid NEXIS | PRO 20TB Engine £9,300.00 ($11,995.00) plus taxes It comes in a 2U box and includes 10 media HDDs, 2 SSD System Drives, Controller with 10 GbE interface, includes QSFP to SFP+ converter (no SFP+ optics), Dual PSU, rack kit, axle Starter 2-user license. Avid NEXIS | PRO 40TB Engine £10,300.00 ($12,990.00) plus taxes. It comes in a 2U box and includes 10 media HDDs, 2 SSD System Drives, Controller with 10 GbE interface, includes QSFP to SFP+ converter (no SFP+ optics), Dual PSU, rack kit, axle Starter 2-user license.